Air Asia Promos 2019 to 2020: P300 ALL IN AirAsia Promo Fare! 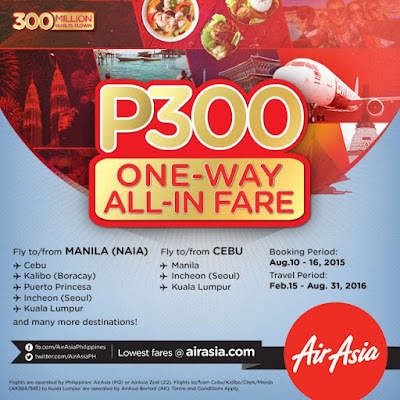 P300 ALL IN AirAsia Promo Fare! Air Asia Promo Fare: Fly to any Domestic & International Destinations from as low as P300 ALL-IN FARE ONE WAY! Here's our treat for you: P300 ALL-IN fares to our destinations! This is our way of saying thank you for flying with us, 300M times!